A strange-looking creature, small and stocky, but broad and strong. Maybe it's a small man, or maybe a large gnome. Maybe it's a member of an unknown race from a distant corner of Seralin, or even from one of the other moons of Anderove. Anyway, the creature calls itself a “dwarf”. 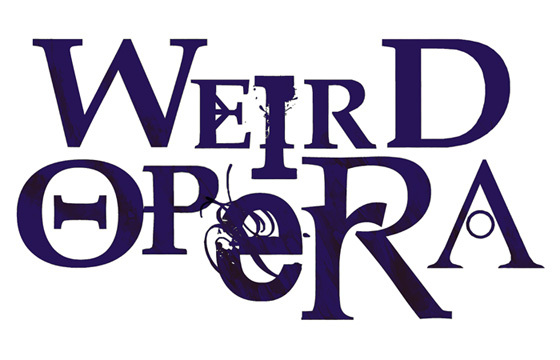 Dwarves are not native to the Weird opera world, but then, Ibbo is not from this world. He comes from a distant planet located in another universe, where immortals rule over an eternal empire. Ibbo double-crossed one of them, and had to run for his life. Following an ancient map, Ibbo found his way into a strange multi-dimensional castle, in which he quickly became lost. Wandering through the castle’s many rooms and corridors, the strangeness and horrors he encountered almost drove him mad. Chased by a swarm of vargouilles, he sought refuge in what appeared to be a chapel. It was there he was contacted by Arak-Kur-Mortahn, The Death Titan, a demonic destroyer of worlds traveling from world to world in his ship of the lost. Ibbo vowed to serve the Lord of Twist and The Death Titan provided a portal key that would activate one of the many magical portals out of the castle. Ibbo ended up on Seralin, where he resides to this day. The dwarf has dull gray skin and wears shiny black leather armor. 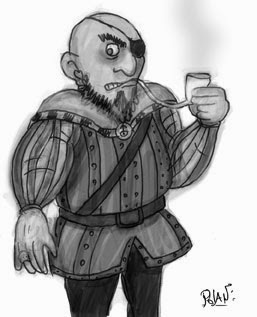 He wears an eye-patch over his left eye, making him look like a pirate, shaves his head bald, and wears his graying beard short. He speaks with a deep voice that could be described as “fatherly”, or as “disturbing”. Pretomournon’s inhabitants don’t notice, but Ibbo has the surly attitude of a typical dwarf; stoic and stern, dour and humorless. In addition, he’s very foul-tempered and mean. He fully intends to help the Lords of Misrule to destroy this world and many others after that. Even though Ibbo’s the Disciple of the 5th Lord of Misrule, he’s happy to let another demon bring about the Apocalypse. It’s for this reason he helps the jester Quinzel to summon her master, Padat The Fall. That, and the girl is easy to take advantage of when she’s in one of her depressive moods. If not working to cause the end of the world, Ibbo indulges in his hobbies: robbery, theft, murder and tax evasion. Not too long ago he stole a chest of magical weapons from smuggler Vithimiris Reizensteijn, with the help of a key provided by key maker Frederika Gvene. He sold the weapons for a large sum of money to the amazon Demostratia. However, Gvene talked under pressure, and now Reizensteijn has offered a substantial award for "the dwarf with the eye-patch". Ibbo: AL C; MV 12; AC 6 (studded leather, Dex); Male Dwarf 9; hp 59; #AT 1; Dmg 1d6+5 (dwarven thrower war hammer, Str) or 2d6+10 when thrown, or by weapon +2; S 16, D 13, C 16, I 15, W 10, Ch 15; M 6; items: amulet vs. crystal balls and ESP; XP 2,400. Ibbo has all the special qualities of the dwarf class. Location: The lighthouse in the harbor, Quinzel’s apartment in the River District, or committing a crime somewhere else in the city. See also: Demostratia, Frederika Gvene, Quinzel, Vithimiris Reizensteijn. Note: Arak-Kur-Mortahn, The Death Titan appears in the one-page dungeon Ship of the Lost. There are lots of monsters said to be the result of magical experiments, and so are the creatures known as stationery vermin. It seems plausible indeed that these pests were an invention of an office working mage, cleric, or clerk who was tired of misplacing his scissors or pencils. Whatever the truth, now stationery vermin are breeding, and have become a nuisance in any office environment. Stationery vermin are small creatures, about the size of rats. Each has a piece of office supplies for a head: scissors, a stapler, a pencil, etc. They can be either bipedal and quadrupedal, and there are species that are bird-like and can fly. Apparently, these shapes are independent of the type of stationery – there are both running and flying scissorheads, for example. 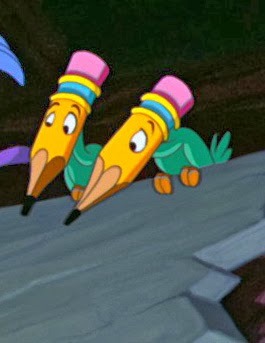 Stationery vermin can be trained to follow orders. Stationary Vermin (2d12): AL N; MV 150’ (50’), (birdlike vermin have 180’ (60’) flying); AC 7; HD 1-2 hp; #AT 1 (bite); Dmg 1; Save Human0; M 5; XP 6. In addition, every type of stationery has a special attack or ability, as given below. Eraserhead. Erase: At will, the eraserhead can erase magical writing as the 1st-level magic-user spell. Glue-Tubehead. Glue: The glue-tubehead can cover any surface with a sticky substance. Creatures touching the glue cannot mow, unless a Str-check is made. If the check is unsuccessful other actions to free oneself can be taken (for example, taking of ones boots or gloves). Pencilhead: Illusory script: Once per day, the pencilhead can disguise it’s writing as per the 3rd-level illusionist spell illusory script. 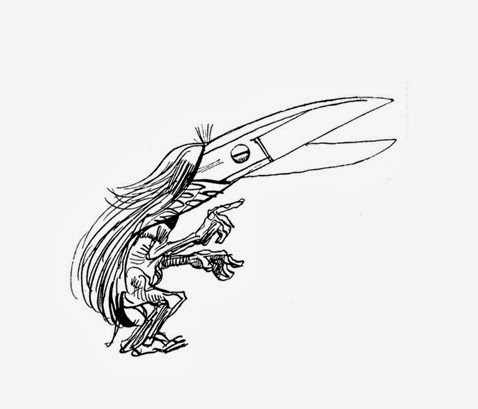 Scissorhead: Cut: The attacks of the scissorhead do 1d6 damage. Staplerhead: Staples: The attacks of a staplerhead do 1d4 damage. Tape-Dispenserhead. Constriction: if the tape-dispenserhead’s attack hits, its target’s legs are constricted, making it impossible to walk without falling (1d4 dmg). This variant is inspired by the way Hit Dice work in OD&D. One die is rolled at first level, but further dice are not rolled at every level of experience. A character’s class determines at which level he gains another Hit Die. For example, a cleric gains his second Hit Die at 2nd level, but doesn’t get his third Hit Die until level 4. A magic-user gets a Hit Die every other level. * Fighters gain one Hit Die type greater than normal for his race. For example, a human fighter would uses d10 for Hit Dice. * Paladins and rangers use the fighter progression, but don’t get the greater die type. * Druids and monks use the cleric progression. * Illusionists and spelldancers use the magic-user progression. * Assassins use the thief progression. Nine-lives cats are a race of intelligent shape-changing felines. They are not lycanthropes, and can transform at will. They can assume two shapes: that of a cat and that of a single unique human. Unlike lycanthropes, they do not have a bipedal cat form. The human form is that of an attractive young woman or, less frequently, a young man. Like normal humans they are very diverse in appearance. They are virtually undetectable from a normal human, except for the pointy, fur-covered cat’s ears that are also visible in this shape. The cat’s ears are easily hidden beneath a hat or cap. Nine-lives cats have infravision of 120 feet. In addition to their alignment language, common, elvish, and halfling they can speak to normal cats and felines, including big cats like tigers and lions. Changing from one form to the other costs one round. Armor and equipment do not transform with the character, and his or her cat shape cannot use any weapons, armor or other equipment. A spellcaster in cat form may cast spells, but cannot handle any material components or use magic items. The cat form is 1’-2’ tall. It has AC 6, Move 120’, and 3 attacks: 2 claws and 1 bite, each doing 1d2 damage. It has a number of d4 hp equal to the character’s level, but may not have more hit points than the human form. 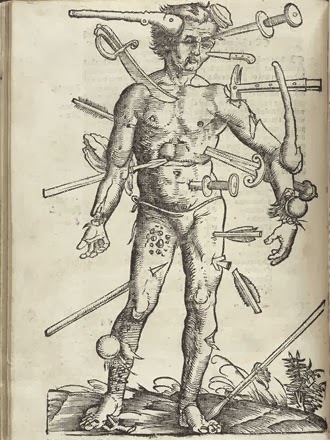 Wounds taken in one form carry over in the other. The nine-lives cat dies when the hp of her current form reach 0. However, the cat has nine lives, and if she has any lives left, she’s raised in 1d6 x 10 minutes as per the raise dead spell. If her nine lives are used, she’s dead for good. A dead nine-lives cat cannot be raised, except with a wish, that can give the character a new cycle of nine lives. Nine-lives cats may select from the following classes, with the indicated level limits. *Nine-lives cats receive a better dice range for hearing noises. For example, 1st level nine-lives cat thieves hear noises on a 1-3, and at 9th level it is 1-5. Hear noise may never be better than 1-5. In almost six hours it will be 2014 in my little corner of the world. So there’s still time for me to do a review of 2013! The year didn’t start well for me, with me being ill and having trouble doing things I really enjoyed – like blogging. In July I came back to this blog and started writing Three Sad Wizards. Most of the posts I made in July and August were about this module. I really like how it turned out and, judging from reactions I got, other people do as well. In September I completed the 30 Day Challenge. Not all questions on the list were interesting, but I tried to make something of every post, and most of the time I succeeded. And after a year of not being able to blog, this did feel as a real victory. I also started a series inspired by the Planescape book Uncaged Faces of Sigil. I did six entries in the series Faces of Pretomournon. So far I’m pleased with how the series is turning out, but I think the entries may be a bit too long. Faces of Pretomournon will return in the new year. In October I wrote my most popular post from this year: Orc Babies. It was a commentary on D&D Next’s “story elements”, that threaten to be completely uninspired and boring. To put money where my mouth is, I showed how I do orc babies in my campaign. Apparently, people liked that. In November I participated in NaNoWriMo. I hoped I could continue blogging, but that proved to be unrealistic. However, I did write 50K words on my novel that is now almost finished. So what will 2014 bring? I’m writing a module called Lost Library of the Death Speakers, which is on hold until I figure out a way to make it less boring. I’m also outlining Valkyries vs. Amazons, an module which can be summed up as Female Fighters in Unreasonable Armor – the Module. However, I also have my Nanowrimo novel to finish, so it may take a while before I have time for it. I’m also writing the DSA game, a clone of the first edition of Germany’s most popular roleplaying game. So far, I have most of character creation, about half of combat, and a lot of spells done. Still a lot to do though, so it will take time. Happy new year to everyone, and see you next year! 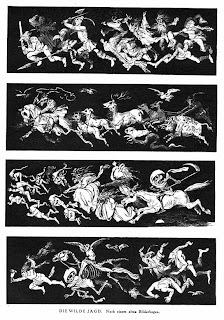 Every winter solstice, the Wild Hunt rides from Castle Woden. 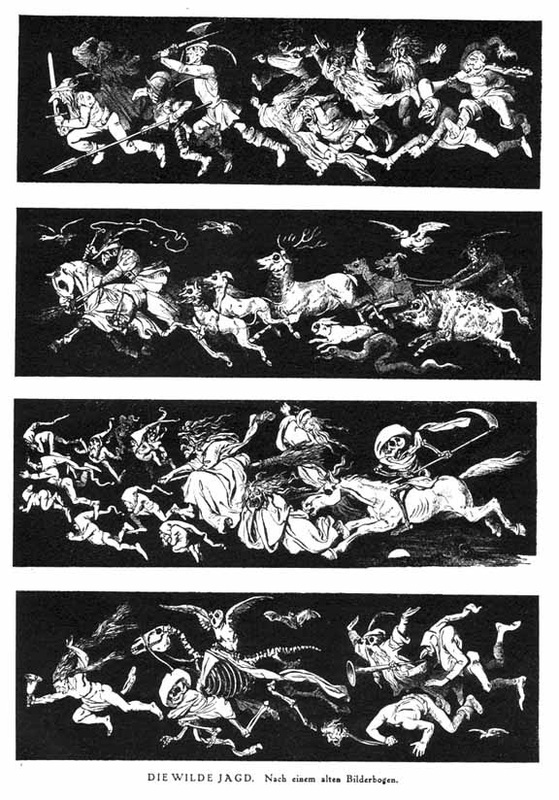 A group of riders with black faces, a large pack of huge black hounds, and numerous spirits or fairy beings, in pursuit of a single mortal being. The Hunt rides over ancient paths and roads, now long gone. If they encounter a farm, a village, or another building in their way , it’s burned to the ground. Master of the Hunt is the Dark Huntsman, demon-like figure with antlers and a leather mask covering the entirety of his face. He rides either a black horse, or a white one, depending if the Hunt hunts a guilty soul, or an innocent. Some years (40% chance) Frau Hulda, the snow maker, rides in front of the Hunt in her chariot. If she’s with the Hunt, a terrible storm rages over the land, felling trees, destroying blowing down wooden structures like fences and barns, and sometimes making casualties. People encountering the Hunt should avert their eyes or risk being swept up by it. Characters who see it must save vs. spells or become part of the Hunt. The fate of such a person varies wildly. Some join the Hunt as hunters, following the Master’s orders, even if they go against their alignment. They will be released after the quarry has been caught and the Hunt is over. Others are not so lucky. 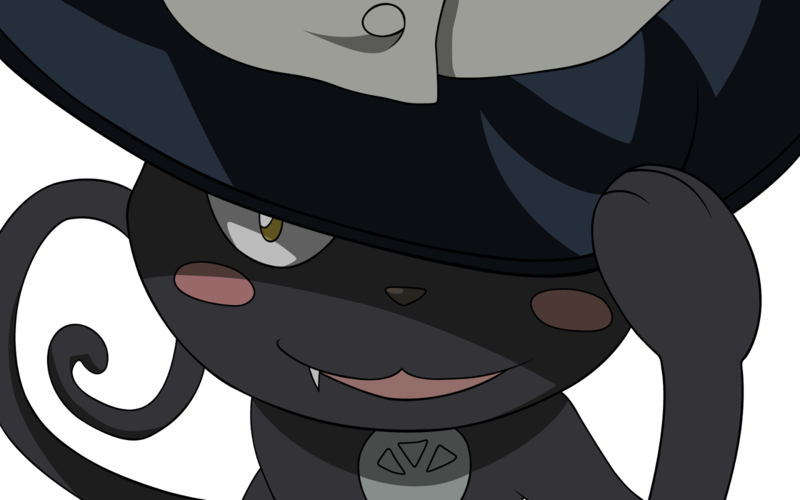 Characters with WIS 7 or lower will join the Hunt as one of its black hounds. The unlucky character will start running on all four and turn into a huge dog. A smaller white puppy will stay behind in his place. After the Hunt is over, the black hounds evaporate and the persons are lost in the spirit world for a year. If his family takes good care of the white pup, the character will be released next winter solstice. Beautiful young girls and boys (CHA 15 or above) will be kidnapped by the riders and taken back to Castle Woden, never to be seen again. The Wild Hunt often rides through its quarry’s home town, destroying the village in the process. To prevent the village from being burned down, villages often cast out girls into the forest, hoping the Hunt’s designated prey is among them. These girls are often taken into the homes of gnomes or witches in the forest. Some of them are lost for good or are found the next day frozen to death. Most of them return to the village safely, with no memory of what happened to them that night. 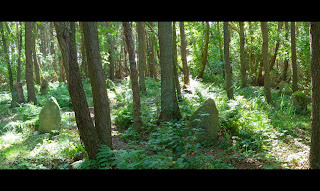 The Hunt’s quarry is usually a girl, often guilty but sometimes innocent. She can always hear the hounds coming closer, and is under the influence of a fear spell during the hunt. The Hunt is over when it captures its prey and shreds it to pieces. 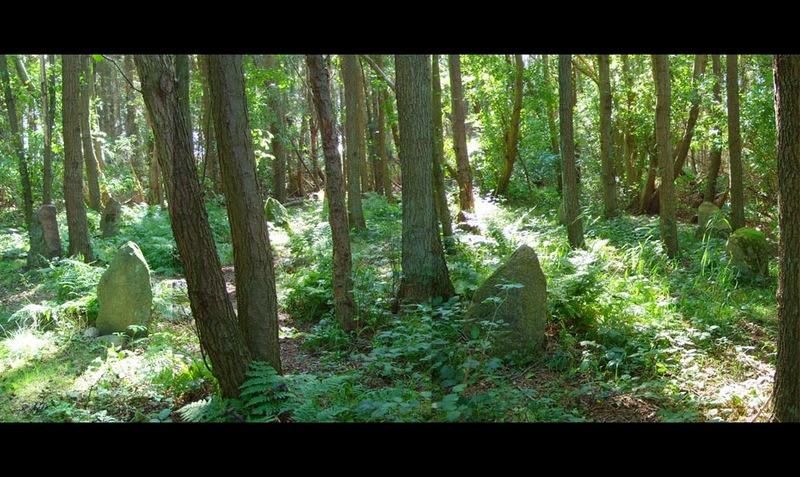 However, deep in the woods is an unnamed stone circle, overgrown and hardly recognizable as such. The bones of the Master of the Hunt are buried there. If the prey manages to reach the circle she’s save. The Dark Huntsman cannot enter the circle, and will release the prey. She will never be hunted again by the Wild Hunt in her life. The Hunt can be fought, but it can never be destroyed. When the Dark Huntsman and his hounds are killed in combat, their bodies will disappear, only to reappear the next night. If their prey is still alive, the Hunt continues. The Dark Huntsman: AL N; MV 180’ (60’); AC 2; HD 15; hp 80; #AT 2; Dmg 1d6+6 (spear +3 ); Save F15; M 10; XP 1900. The Huntsman usually attacks with his spear +3. He may also steer his horse to trample an opponent, for 4d6 damage. Frau Hulda: AL C; MV 120’ (40’); AC 3; HD 12; hp 72; #AT 3 (2 claws, 1 bite) ; Dmg 2d6 (claw) or 1d8 (bite); Save M12; Special: Spells; M 10; XP 2000. Frau Hulda specializes in spells concerning the weather. She can ride her chariot over victims, for 3d10 of damage. Hounds (3d4): AL C; MV 120’ (40’); AC 4; HD 6; hp 25 each; #AT 1 (bite); Dmg 1d6; Save F6; M 9; XP 570. The Hounds of the Hunt can cause fear in any mortal being. This specialized ritual should be cast in the ten days between the winter solstice and the new year in the stone circle where the Dark Hunter was buried. The spell costs thirty minutes to cast, and requires an item belonging to the intended victim. Once the ritual is complete, the ghost of the Hunter will appear and listen to the caster’s reasons to call the Hunt on someone. No matter if the reasons for doing so are just or not, the spell compels the Hunt to obey and pursue the quarry designated by the spellcaster.